It isn’t just that though.. There’s waking up with creases on my arms and face due to sleeping awkwardly on a blanket, and the most common of all, having that horrible hair tie mark around my wrist. You girls should be very familiar with it. When you carry a hair tie with you on your wrist in case of emergencies and when it’s too tight, it leaves that gross crease that runs deep and red all around your wrist GAH. I absolutely cannot stand that and would rather keep my hair tie in my pocket than endure it. As a result, I end up losing a lot of hair ties. Heh? Well, there’s finally a solution! Thankfully, they’ve managed to find a way closer to home through Tie-Ups, a small start up by a good friend of mine, Rachel. Look at those gorgeous colours and for only RM18! There are loads of prettier colour combinations on the site itself and not only are they great for wearing around the wrist without those awful marks, they’re awesome for tying your hair with and for wearing as accessories. Matching bracelet for my favourite colour! Tie-Ups are awesome in the sense that they’re gentle on your hair and leave no kinks, which fortunately, means less tugging and less hair loss! Some Tie-Up accessorizing, taken from their website. Completing my outfit with one in Taiping! The only problem for me is actually remembering to wear them out! If I forget and desperately need to tie my hair, I end up using awful orange rubber bands from restaurants or I stuff stationery into my hair and twist them into a bun. Which isn’t very sanitary (for the owner of the stationery) or good for my hair, heh? But let’s hope you aren’t as forgetful. 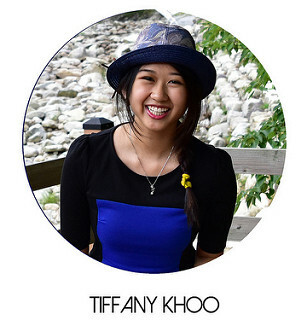 And just for being a faithful reader, all readers of tiffanykml.com gets 20% off on your order! Just key in “Tiffany” upon checkout to enjoy this discount. PS: Free shipping for all orders above RM30! Lucky us! It’s Always Sunny In Philadelphia!